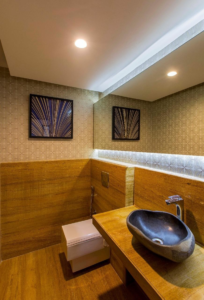 Bathrooms are the black sheep of the house, especially in Indian households. They are seldom focused upon in terms of interior. It’s given minimal space and attention. 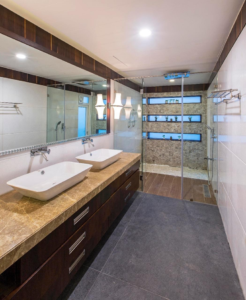 However, in the modern home, a bathroom is as much of a statement as living rooms or bedrooms. So, it’s important to make the bathroom as beautiful and calming as possible. 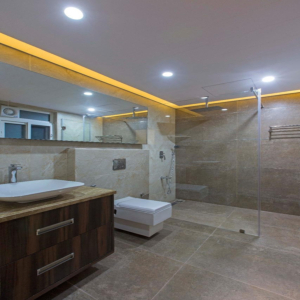 Shower cubicles : are increasingly becoming popular among Indian households.It helps the bathroom stay clean and dry. It also helps trap the steam of a hot shower. Such cubicles should preferably have tiled walls and a glass door for easier clean-up. Shelves built into the wall help hold products while saving space. These shelves can be tiled or glass, maybe with a pop of color or pattern for more intrigue.Alternatively, shower curtains are another good option for a shower space. Bathrooms tend to be shared in the mornings between people, especially in bigger families. Having two sinks help save time with getting ready in shared bathrooms as each person can get ready separately. Don’t hold back when it comes to accesorising. Adding small plants if there is a source of available sunlight, hanging art pieces (make sure it’s a no-splash zone), buying unusual sinks and mirrors etc. will look amazing in bathrooms. Finally, mix and match. Usually bathrooms all tend to be painted in one colour and done with. Instead, maybe opt for wooden tiles if it goes with the rest of the house or ones with beautiful patterns and textures. Using a different type, texture or colour of tile for backsplash areas near sinks and on the walls of the cubicle breaks up the pattern and looks interesting. So, when designing your bathroom, give it some love. At the end of the day, when relaxing in a luxurious bath, you’ll know it’s worth the effort.